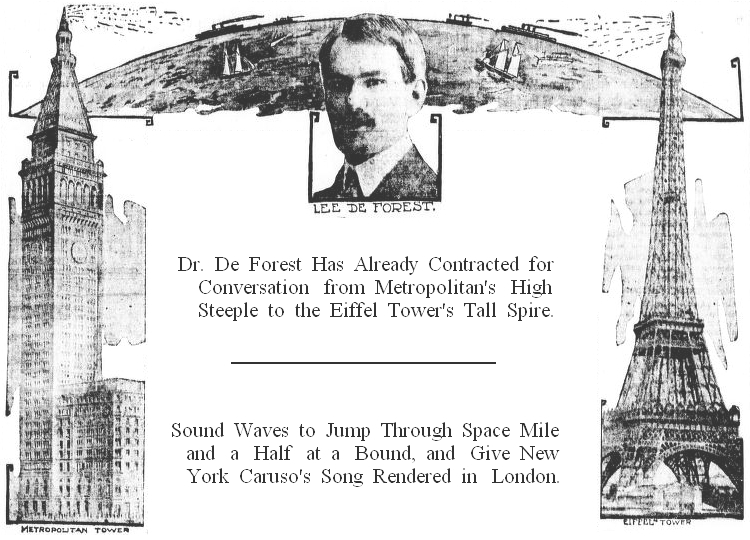 "You'll pretty soon be able to murmur to your sweetheart in Paris over the telephone, provided she makes the trip to the top of the Eiffel Tower," says Dr. Lee DeForest, who invented the wireless telephone, "and furthermore it won't be very long before you'll be able to hear Caruso singing a new opera role at least 6 months before the production is made in New York." Such a prediction, savoring of Bellamy and Verne--nobody even had a thought of Munchausen--fell from the lips of the doctor as he sit, clad in overalls in his buzzing, zipping wireless telephone laboratory, near the top of the Metropolitan Life Insurance tower, in Madison avenue, yesterday afternoon. He had just signed a contract with the directors of the Metropolitan Life Insurance Company, which gives him the sole right to use their 700-foot tower in Madison Square--the tallest office building in the world--with the cloud-grazing tip of the Eiffel Tower--the tallest structure in the world. "In a year," boasts Dr. DeForest, this connection will be completed. Of course, there are numerous experiments to be conducted, and we expect to encounter scores of difficulties, but I am confident that we will establish the connection." Dr. DeForest is a young man, who looks as if he means what he says, and, furthermore, knows what he is talking about. "The reason I am so confident," he continued, "is because when I was in Paris last spring I heard wireless messages from the station at Glace Bay, Nova Scotia, to the Eiffel Tower, and the machine used was of only two horse-power, while we have apparatus of ten times that power, which will make it comparatively easy to connect with the Metropolitan in New York. The antenna buzzed with the message, and I got my idea then. "The antenna? That is the wire or network of wire. The word mean literally the 'feeler' and is generally applied to insects, and I think only the French, with their peculiar tact in applying names, would have thought of the application in this particular. Certainly it is most appropriate." Dr. DeForest not long ago climbed to the top of the Metropolitan town and adjusted a wire. The connection is to be had just under a circle of arc lights at the very top, under the base of the flagpole. The aesthetic soul of the architect of the tower, Mr. LeBrun, was shocked. He thought there would be protuberances and wires that would destroy the symmetry of his tower, but not so. There will simply be eight little copper wires extending from the tower to the station, which will be built on the top of the eleven-story part of the Metropolitan Building, on the Fourth Avenue side, and there will be absolutely invisible from the street, so there will be no smack in the eye to art. "My experiments will be comparatively inexpensive," said Dr. DeForest. "I have no towers to build, which ate up so many hundred of thousands when the wireless idea was new, for the Eiffel and the Metropolitan are already erected. In October, or, at the latest November, I expect to have wireless telephone communication with the nearby large cities, and before long with Havana. "When I say," he continued, "that you can hear a new Caruso song an hour or two after he sings it, I mean that if he sings at Covent Garden, London, for instance, the gramophone record is sent to Paris, there adjusted to our apparatus and waved over to our tower in New York. "The time is not far distant when a passenger in the saloon of an ocean liner will be able to hear the strains of an opera which is being given at the Metropolitan, Manhattan or Covent Garden opera-houses."